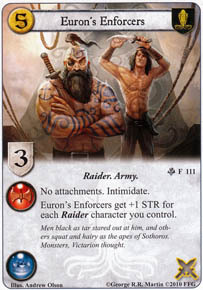 Euron's Enforcers get +1 STR for each Raider character you control. Flavor Text: Men black as tar stared out at him, and others squat and hairy as the apes of Sothoros. Monsters, Victarion thought.